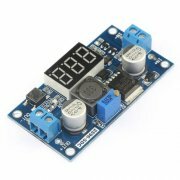 With voltage meter display;voltage meter error of ±0.1V;the range among 0~40V. (note: to ensure the voltage meter accuracy, please make sure that the input voltage is 4.2V or more). Voltage meter can be closed by long pressing button(minimum power loss). Maximum output current can be as high as 3A,but normal and stable working current is2A. Use 150KHZ internal oscillation frequency,which is belong to the second generation of switch voltage regulator with low consumption and high efficiency. LM2596 Step Down Power Module design based on XL2596 as main control chip,attached digital tube to display voltage at that time to highlight smart function. What’more, schottky diode provides protection of reverse connection.